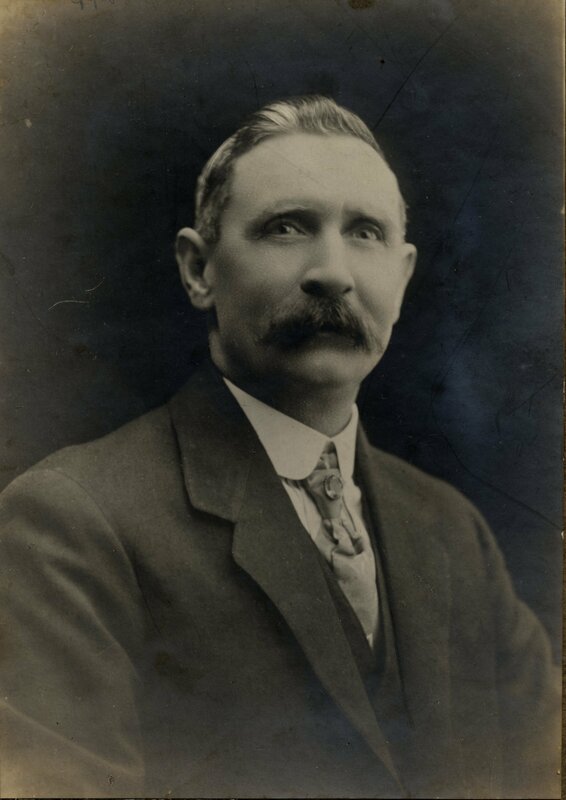 William Bagnall was born in 1875 and was my Great Grandfather. 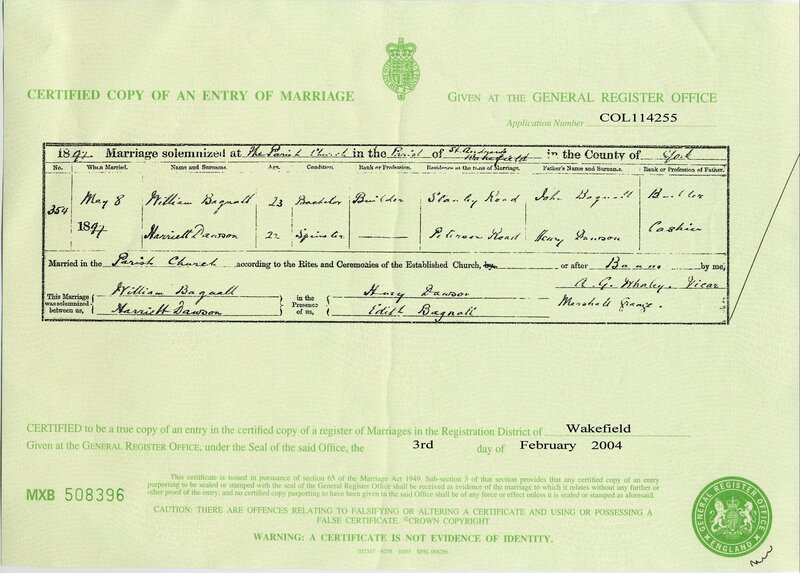 William marries Harriett Dawson 8 May 1897 Aged 23, Harriett is 22. With this marriage certificate, I was able to determine Harriett's maiden name and confirm both Harriett and William's ages. I also discovered Harriett's Father's name - Henry Dawson and found the name of another Bagnall - Edith Bagnall, who I had never heard of before and who I suspect may be William's Aunt? If you have any information about Edith, please contact me. We know that by now, William was his own man, married and living in his own house with his young family since there is also an entry in the 1901 census for William and Harriett's family. I only discovered this photograph because of a press cutting from 1979 which mentioned it. 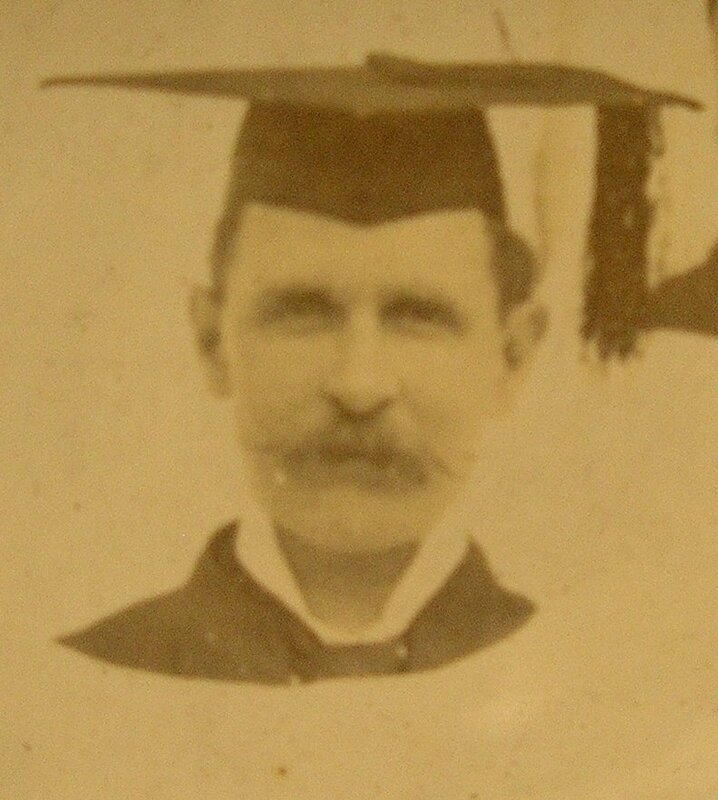 Close up detail of William Bagnall from the photograph above. Pamela & Dennis Brockbank and I went to the cathedral and were very kindly allowed into the practice room to look for the photograph where I was able to take these digital copies. Many thanks to the staff of the Cathedral for allowing us in. 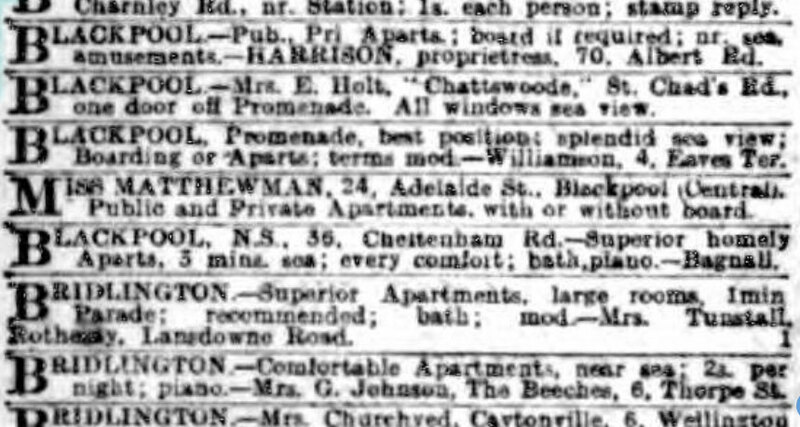 "Bagnall Harriett (Mrs.), shopkeeper, 15 Field Lane"
Was it William who built the apartments at 36 Cheltenham Road in Blackpool? From Google Streetview, I can see they are still there and are still apartments! I love that they had a bath and a piano! Bricklayers wanted at Horbury Sewage Works.-Apply on the job. Wm. Bagnall, Contractor, Wakefield. 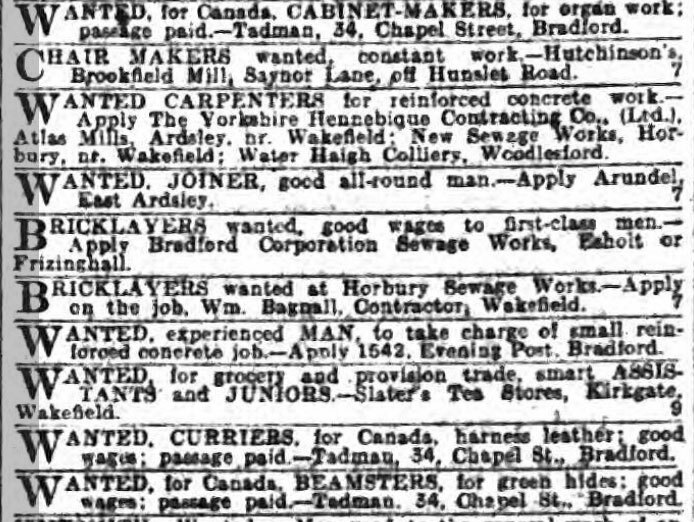 1912 William advertises for bricklayers at Horbury Sewage Works. According to this article about Horbury Bridge, the sewage works were built in 1893, so this contract must have been a repair or extend to the site. 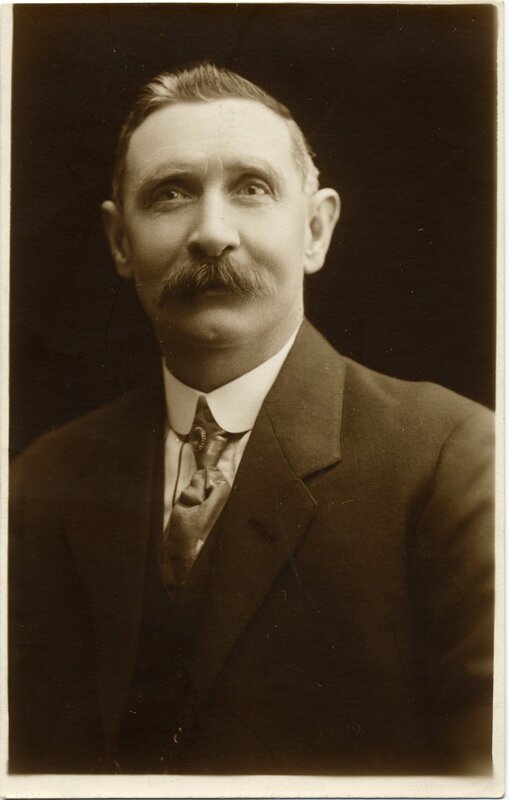 William Bagnall was a prominent builder of Eastmoor and was responsible for much of the property. He lived on Stanley Road for a period and when the Cathedral spire was repaired Mr Bagnall was asked to go up and make sure the repairs had been carried our correctly. This photograph shows the Co-op on Stanley Road but the house on the extreme right was where William Bagnall lived for a period. The house front was altered just prior to the 39/45 War when Stanley V. Potter changed the bay window into a shop front for his electrical business. Although the Buildings are now pulled down the tree still stands which was in the garden of the house with bay window. Another photo of Stanley Road from the 1920s. Stanley Vere Potter was the son of the manager of the Empire Theatre in Kirkgate and trained as an electrician with the Tram Company. When he married Gladys Godwin they set up home at 108 Stanley Road. Stanley set up his own business building and selling radios and charging batteries. He converted the bay window into a shop front. The business had to close in 1939 when war broke out. Stanley, being a skilled electrician had to work repairing public transport. In the Kellys Directory of 1922 in the "Wakefield Private Residents" section was listed "Bagnall William, 108 Stanley Road". This was not far away from his brother Harry at 19 Stanley Road. From his son John Henry's R.A.F. discharge papers, we know William was living at Moorvilla in 1918. William is listed in a directory both as private resident at 108 Stanley Road (Moorvilla) and as "Bagnall William, builder, Rawling's yard, Stanley Road T N 392". The same year, it is reported that a builder called Bagnall was using the outbuildings of the Stanley Victoria Club for stabling his horses. From examining the photo carefully, it looks like William is wearing a watch chain with a Masonic fob. Photo shows two close-ups from different wedding photos (John Henry's Wedding and Isabel's wedding below) and on the right, an example of a masonic fob in 9ct gold. March 1929, William Died Aged 54 at his house at 211 Westmorland Avenue. The exact date is unclear. According to the obituary in the Wakefield Express he died March 1929 aged 54 on a Tuesday (Which must therefore have been the 5th, 12th, 19th or 26th). 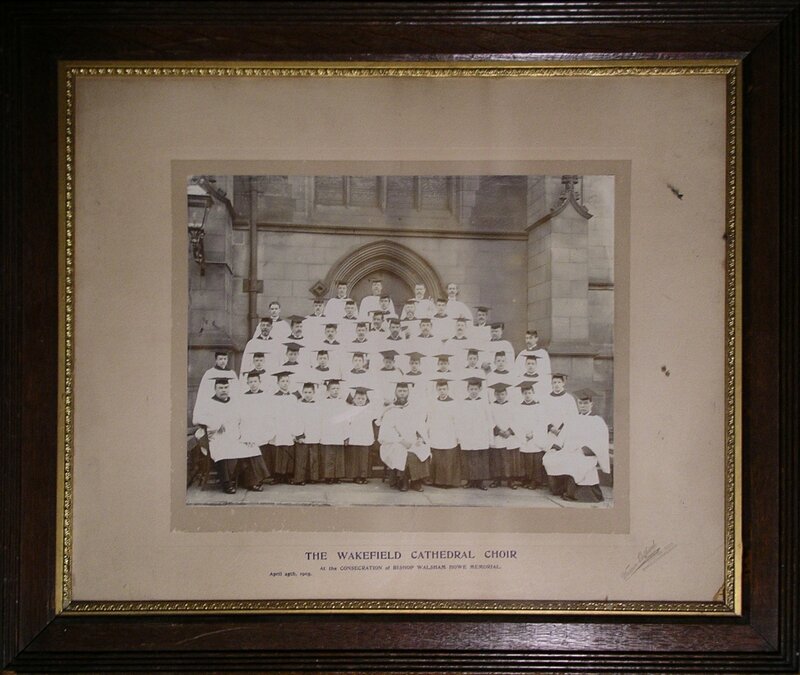 According to the Church Records at St. Paul's Church, Marton (01253 692047), he died on 7th March. According to the headstone he died on 4th March. According to the obituary, he was buried in Marton Cemetery, Blackpool on a Thursday (Which must therefore have been the 7th, 14th, 21st or 28th) . 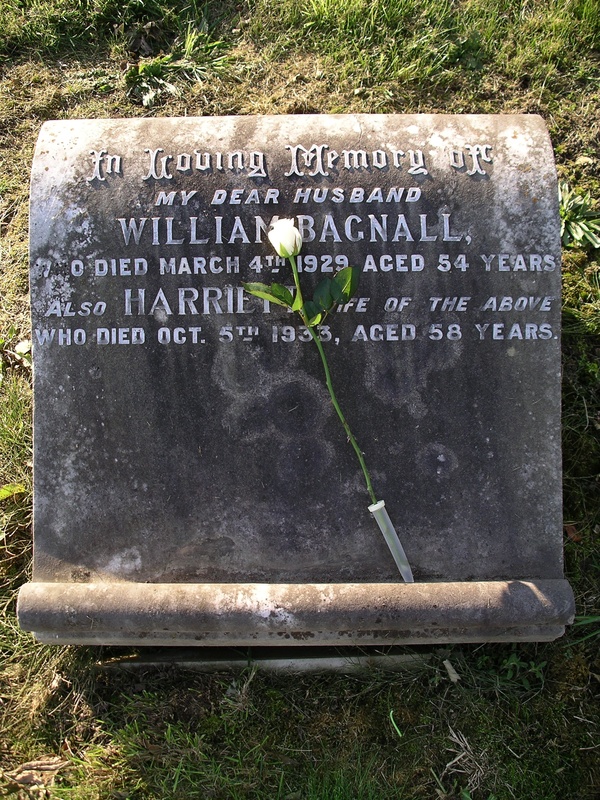 This is the last resting place of both William & Harriett Bagnall, in Blackpool. The white rose I placed because it is the symbol of Yorkshire.